4.3 What Can We Do? The regular health benefits of participation in physical activity are well studied; however, physical inactivity remains one of the largest worldwide threats to health and is the leading preventable cause of morbidity and mortality. Since 1980, the prevalence of obesity worldwide has more than doubled in children and quadrupled in adolescents. In 2012, more than a third of children and adolescents were overweight or obese. Physiotherapists are faced with an ever-growing challenge in efforts to promote physical activity in order for people to live a healthy life. Physical activity has its own risks such as injuries and accidents to participants. Children and adolescents are the largest participants in physical activity and they are at a particular risk of these injuries because of a high level of exposure, improper technique, poor proprioception, muscle weaknesses, apparatuses not adjusted to their size, absence of fear and understanding of risks. Physical activity is the leading cause of injury and hospital room visits in adolescents. Most injuries or accidents resulting from physical activity are non-life threatening however they often result in pain, disability, school absence, absence from physical activity, and sometimes in dysfunction in the short and long-term. Injuries to joints can accelerate the development of osteoarthritis and therefore prevention of physical activity-related injuries is essential. Emery showed in a review that injury prevention strategies in children could reduce the risk of physical activity related injuries. Physiotherapists have an extremely important role in the prevention of injuries and accidents as a result of physical activity in adolescents so they can continue to enjoy the physical, social and emotional benefits of activities without compromising their safety. Therefore the aim of this Wiki is to critically evaluate the role of the physiotherapist in the prevention of injury and accident as a result of physical activity in adolescents aged 12-18. This is Reflective Ralph. He will accompany you through this Wiki resource, and help guide your learning by posing questions you are encouraged to think about. Additionally, scrolling over pictures and tables throughout the Wiki will magnify them and also allow you to see the associated citation. In a world where the demand and burden on the public healthcare system is rising and resources are becoming increasingly limited, prevention is a promising way to deliver cost-effective, sustainable healthcare and create long-lasting healthy populations. To meet these demands, the role of physiotherapists must expand to accommodate this changing healthcare environment. Many resources already exist studying the positive effects of preventative physiotherapy on spine health, neurological conditions, and falls prevention. With the push to get individuals, children, and adolescents active early on, there is also an increased need for participants to be educated and prepared on how to safely perform their chosen physical activity so they can be engaged members in their healthcare. It is vital for physiotherapists to expand their scope of practice to adapt to these changing conditions. As allied health professionals (AHPs) who work in partnership with patients to help them achieve their goals, physiotherapists are well-prepared to help set up prevention agendas by having healthy conversations with patients, clients and families. 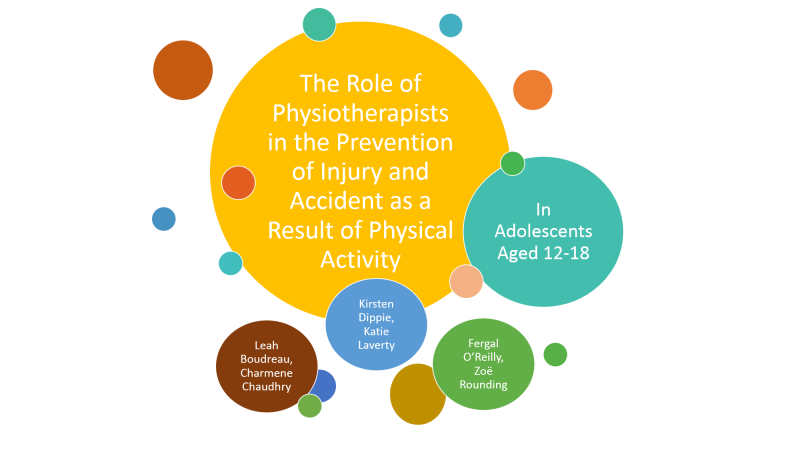 With this in mind, this Wiki resource aims to investigate and build an understanding around the role of physiotherapists in the context of injury and accident prevention in adolescents aged 12-18. This resource will look into responsibilities involving legislation, equipment, prehabilitation and education. Explain the key contributing factors to injury and accidents in adolescents participating in physical activity and how these factors may impact physiotherapy practice. Critically evaluate the role of the physiotherapist regarding injury and accident prevention in adolescents participating in physical activity. Critically evaluate the key strategies (preventative equipment, education, and prehabilitation) of injury and accident prevention for adolescents participating in physical activity. Define the term prehabilitation and justify the inclusion of each component for the prevention of injuries and accidents in adolescents participating in physical activity. Critically reflect on the challenges facing the physiotherapist in the prevention of injury and accidents and make evidence-informed recommendations which can be implemented in practice for this population. The following resource is designed for students and recently qualified Band 5 physiotherapists, looking to enhance their continual professional development, in regards to the prevention of injuries and accidents in adolescents aged 12-18. This resource however is not to be exclusive to these groups as other individuals interested in this topic area may be able to extract relevant information as well. For the purposes of this Wiki resource, below are our definitions of key terms. The World Health Organisation (WHO) defines physical activity as “any bodily movement produced by skeletal muscles that requires energy expenditure”. This broad definition entails that there are various ways in order to be physically active such as: play, sport, walking, cycling, housework and gardening. The WHO recommends for children and adolescents to accumulate at least one hour of moderate activity on most days of the week. Three days per week high intensity physical activities should be incorporated. All children and young people should minimise the amount of time being sedentary for extended periods of time. Take this time now to reflect on why prevention of injury and accident as a result of physical activity in adolescents is important for future generations and on the future healthcare system. The CSP emphasises the need for physiotherapists to encompass these core dimensions in their work, and they can be applied to the expanding role of physiotherapists in the prevention of injury and accidents. A physiotherapist must be open to personal and people development, take into account health safety and security while developing new methods of open communication to implement ways of improving safety, be critical when evaluating their services for quality and improvement purposes, and be senstivie to issues of equality and diversity. A physiotherapist can develop an injury prevention programme through the use of intervention mapping (IM) protocol. This involves a systematic process that prescribes a series of six steps in order to develop theories and evidence based health promotion programmes. This six-step process can aid physiotherapists in the development of various prevention programmes such as the prevention of injury and accidents in adolescents as a result of physical activity. For an example of this IM protocol used, please read the following article available in the References section: Design of iplay study: systematic development of a physical activity injury prevention program for primary school children. Risk factors are generally the leading guide for preventative measures in physical activity. 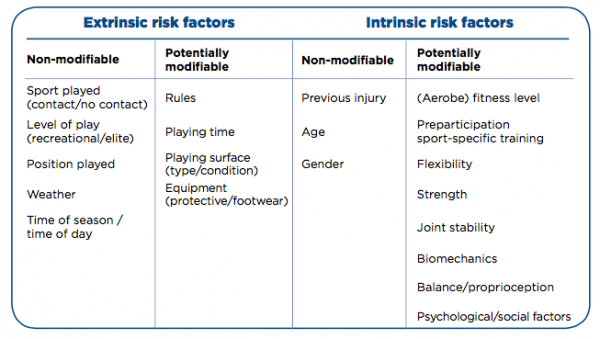 These risk factors can increase the risk of an injury or accident as a result of physical activity in adolescents and can include both extrinsic and intrinsic factors. Injuries and accidents can also be caused by a combination of these factors. It is important for physiotherapists to identify these risk factors in order to aid in prevention. Health benefits of physical activity are extremely important however physical activity also exposes the participant to a risk of injury or accident. Physical activity such as sport and recreation, cycling, skateboarding and playground use is the most common reason for Australian youths aged 0-16 to be in an emergency department and 14% of these presenting injuries require hospitalisation. Similar results have been found worldwide in countries such as Norway, France, New Zealand and the United States. Not only do injuries and accidents related to physical activity affect healthcare services, they also affect school and work time. A study conducted in the Netherlands showed that school absence occurs in 7% of children and adolescents who sustained a sport injury, and the mean duration of school missed by these children was 8 days. This means that 0.02% of the total population who visit school and participate in physical activity are absent from school one or more days. With a mean duration of 8 days, the total absence due to sports injuries can be calculated at 794,000 days a year. In addition, 22% of people who sustained an injury were also absent from physical activities. The economic consequences of physical activity-related injuries in adolescents are not known, but direct medical costs were estimated to be approximately £145 million and indirect costs (such as school or work absence) was estimated at approximately £360 million. These preventable injuries increase the wait time for people to see a physiotherapist. In the NHS the average wait time to see a physiotherapist in a musculoskeletal outpatient department is approximately six to eight weeks. Therefore if a plan is put in place to prevent these injuries less persons would require rehabilitation from a physiotherapist. Overall, the safety can be improved in many of these activities so that participants are able to continue to enjoy them without their health being compromised. What does NHS Scotland recommend for physical activity for children and adolescents? What are the main contributing factors that increase strain on health care? All sports have their own legislations when it comes to protective equipment, but there are not specific laws for types of physical activity. In this section we will provide links to the laws for a number of sports and types of physical activities and discuss the role of the physiotherapist in enforcing them and ways in which to do so. Do you think physiotherapists should have a say in laws regarding preventative strategies and player welfare? What are some strategies we can implement to guarantee a space at the table and make our voices heard? There is more of a debate around cycling and boxing regarding helmet use so here we will highlight the controversial issues. Cycling, classified as both a sport and type of physical activity, is increasing in popularity in the UK as a means of exercise but also of transport. 40% of paediatric hospitalisations and deaths are due to head injury following a bicycle-related trauma. Despite this it is currently not required by law to wear a helmet in the majority of the UK, although there have been many calls by different bodies to make helmet wearing compulsory. It is however stated in the Highway Code (Rule 59) that cyclists should wear a helmet which conforms to the current regulations, is the correct size and is securely fastened. The arguments of cycling advocates against having a mandatory cycle helmet law are that there will be a dramatic decline in the number of people cycling and that will lead to an increase in premature deaths and have a greater impact on the populations’ health than the risks of head injuries from not wearing a helmet. Cycling UK reports that 7-8% of head injuries in children admitted to English hospitals are due to cycling, with a small number of these being to areas of the head that a helmet may protect. Isn’t encouraging anything that could save the lives of our children or reduce their risk of injury worthwhile when they are the generation that will be looking after us and have the majority of their lives ahead of them? In 1999 the British Medical Association (BMA) believed in the potential drop in number of cyclists and recommended there be no law on bicycle helmets but still recommended the use of helmets, however in 2004 the BMA changed their position and became in favour of mandatory cycle helmets. This change in stance came about because of their beliefs into the protective effects of cycle helmets in reducing the number and severity of head injuries. Whilst it is not a legal requirement in the majority of the UK to wear a helmet, Jersey has made it compulsory for children under 13 to wear cycle helmets. You can read about that here. More than 20 countries around the world have made the wearing of cycle helmets compulsory including Finland, Sweden, Australia and some US states and Canadian provinces. This is section we will explore the impacts of these laws on cycling rates and injuries in some of these countries. A study in Canada focussed on cycling related injuries of children admitted to hospital during 1994 and 1998. The rate of head injuries suffered by children when cycling had a significantly greater decline in provinces where legislation regarding a compulsory cycle helmet was adopted when compared to provinces where such legislation was not adopted. This trend was also found in New South Wales, Australia by Walter et al. where there was a large reduction the rate of head injuries among cyclists following the implementation of legislation. Macpherson et al. 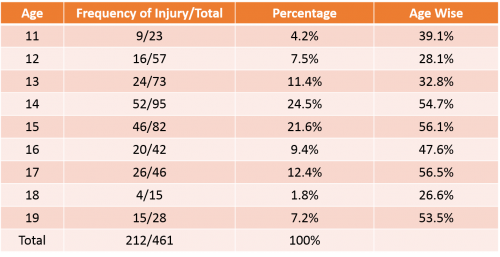 discovered there was also a decline in the rate of other types of injuries however this finding was not statistically significant. Macpherson and Spinks found the risk of a cyclist suffering a head or facial injury was reduced by 88% and 65% respectively if they were wearing a helmet. A systematic review looking into injuries and use of helmets found there to be reductions in the risk of suffering head injuries (51%), serious head injuries (69%), fatal head injuries (65%) and facial injuries (33%). The introduction of mandatory cycle helmets in Ontario in 1995 does not appear to have an impact on the cycling participation of children in the East York area of Ontario. Changes were noticed in the pattern of cycling but these were related to the location of where children were cycling and factors including weather. This study shows that introducing legislation that makes cycle helmets mandatory does not have a negative impact on the number of children cycling. In a Cochrane Review Macpherson and Spinks highlighted that there was not enough evidence to prove or disprove the argument that introducing cycle helmet legislation causes a decline in the cycling population. They did however find that the introduction of legislations increased helmet use and reduced the number of head injuries related to bicycle use. Physiotherapists, alongside the BMA, have a role in educating the population that while helmets are not mandatory, they do have protective effects against head and facial injuries. While there is currently no law advocating the compulsory use of helmets, physiotherapists can address the reasons people choose to not wear them; this could be undertaken during one-on-one time with patients and combatting these barriers with patients could lead to an increase in those using helmets. With the age group we are focussing on it could prove beneficial to encourage the use of helmets from an early age so it becomes habit for them throughout their life. As physiotherapists we can also take our own advice on board and wear helmets routinely so that the general population see them being used and this becomes the norm. Do you think implementing helmet-wearing as law would work and would it be taken up well? What could be done to increase interest/compliance with helmet wearing? Prior to the Summer Olympics (2016) the law permitting amateur boxers to wear protective head gear during a fight was changed. Male boxers were no longer permitted to wear protective however it was still mandatory for female boxers to wear them. Headguards are not allowed during elite male (19+ years) competitions however they are still mandatory within all other categories but the International Boxing Association (AIBA) are able to withdraw the use of headguards during non-elite competitions; this is in preparation for the removal of headguards in all competitions from January 2018. In sports such as rugby union and football there are recognised concussion protocols (e.g. ‘If in doubt, sit them out’) which you can read about here (World Rugby - Concussion Management) and here (Football Association - What is Concussion). Although these protocols are not considered protective equipment there is a question to be asked: is it ok that in these sports we are trying to recognise concussion and reduce the risks to people of having secondary concussions whilst in other types of physical activity such as boxing and cycling they are trying to justify not wearing protective equipment for the head? An overview of how laws are made is provided by this article here. In the section titled ‘Interested people and groups are consulted’ it explains that those who may be affected by the proposed new law can be met by a minister and it can be discussed. For a law to be passed on making cycle helmets mandatory allied health professionals (AHPs) should be consulted due to them having to deal with aftermath so to speak. AHPs should have a place at the table when discussing laws that have an impact on the health care service and on the wellbeing of the general public. Physiotherapists have a major role in the rehabilitation of cycling injuries from fractures to those requiring surgery; and make up a multi-disciplinary team with occupational therapists and speech and language therapists to work closely with those who have suffered traumatic brain injuries. Another way physiotherapists can have a role in the wearing of protective equipment is to utilise the time spent with patients during assessments and treatment sessions. Physiotherapists have the advantage of having a longer duration of contact time with people than most other professionals. Physiotherapists can incorporate questioning about whether their patients utilise protective equipment during their subjective assessments and provide education to people during their rehabilitation. This does not necessarily need to be following an injury, however this could be an opportunity to reinforce the need for equipment, but also if the public visit a physiotherapist for advice on how to change their behaviours to gain a healthier lifestyle. Injuries are a common factor among sports people and physical activity which means protective/preventative equipment may be necessary to reduce the risk of injury. The diverse and vast nature of today’s sporting activities have led to the development of various protective equipment for each sport depending on the risk of injury associated with it. Adolescents aged 12-18 experience a higher risk of accident or injury associated with taking part in sport as their brains and bodies are still developing. There is more concern for safety in physically active adolescents who are often involved in more than one sport and may be on teams with multipl age groups. This means they can be quite involved in vigorous regular physical activity, which increases the need for them to wear protective equipment at all times to be adequately protected from serious harm. Click this link to take an introductory quiz to see what you know about protective equipment. You may find it helpful to come back and retake the quiz after completing this section. Click this link to read a review of evidence for prevention of sports injuries from the UK Focal Point for Violence and Injury Prevention. Below are a few short videos illustrating some of the issues and dangers involved in contact sports. You can click here to read about mandatory and recommended equipment for ice hockey by the International Ice Hockey Federation's Inline Official Rulebook 2015-2018. Helmets are often mandatory or highly advised in a number of sports to reduce the risk of injury from a blow to the head (e.g. American Football, Ice Hockey, Cycling). 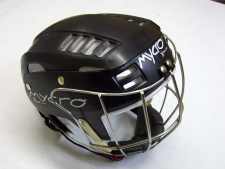 Faceguards are frequently included in many ball games such as hurling or baseball to prevent facial injuries. In cycling specifically, it has been shown that wearing a helmet can reduce the risk of severe injury from an associated blow to the head by approximately 63-88%. 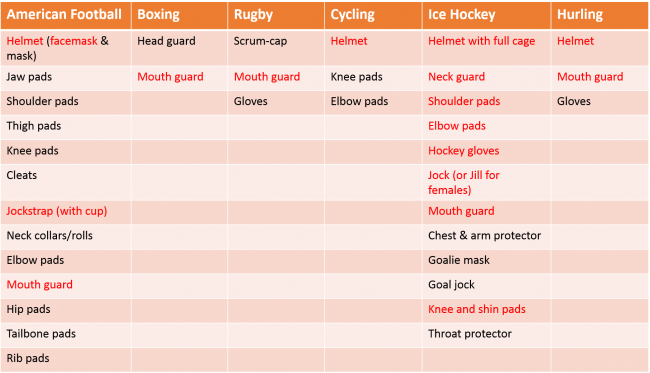 Research is less extensive on the use and impact of helmets in other sports but there are many benefits in association with the wearing of helmets in sports such as ice hockey and rugby. Additionally, in other sports such as cricket, in Australia the compulsory wearing of helmets in younger players reduced facial, neck and head injuries from 35% to 4% with its introduction. Knee braces are a specifically designed support made from elastic, foam or plastic which provide assistance to the knee joint during motion and also provide protection against direct blows. They are used throughout the world but their ability is unclear in terms of preventing injuries, although this may be the case as there is evidence to show its protective properties to reducing the risk of ligament sprain and giving a larger resistance to blows to the knee. Ankle braces fundamentally provide a carbon copy to that of the knee brace with a focus on the ankle which helps to reduce range of motion of the ankle. Traditional taping may also be used in sport which helps to limit ankle movement in order to prevent injury. Ankle ligament sprains are the main preventative area these braces/taping methods aid especially in those who have a history or predisposition to ankle sprains. Evidence suggests braces or taping can reduce the likelihood of ankle sprains by 69%-71% amongst athletes with previous ankle injuries. Mouth guards or also called gum shields are used mainly in contact sports where they act as shock absorbers and separate the lower and upper teeth as well as teeth from its surrounding tissue. The specific shock absorbing characteristics of this sports protective equipment reduces the force transferred to teeth which therefore helps to prevent orofacial or dental injuries which can be caused by blows to the head in sports such as boxing, rugby and ice hockey. Click this link to take a prepatory quiz to test your knowledge about the statistics and factors affecting sports injuriesin order to start thinking about these topics. You can take this quiz again after completing this section to consolidate your learning. Lack of protection: A lack of protection in contact/high velocity sports in particular may cause injury so protective equipment is necessary to to reduce the impact of the level of force exerted on the individual and in turn reduce injury risk. Field/Facilities: The terrain/ground may lead to a reduction in grip such as that in ice hockey. Slippery/uneven surfaces can lead to a harder fall during contact. Inappropriate footwear: Inappropriate footwear may lead to reduced protection and control of the ankle and foot. Physical games: Serious injury may result from contact such as a direct blow or as a result of falling to the ground. Lack of knowledge/facilities surrounding appropriate equipment use: If particular sports protective equipment, such as a helmet, is not worn correctly/snugly in place it can lead to a reduction in its effectiveness in reducing serious injury. Rules/Regulatory bodies: In sports such as ice hockey, there is player contact where one player fends another off the play which can result in serious harm to the individual involved. Age: If an individual is much younger than a fellow player it can have a significant influence on the development of injuries for contact sports in particular. A person playing at a young age is also more vulnerable as their bones are still growing until adulthood. Hurling (or Camogie) is an Irish national sport where two teams consisting of 15 players each use a 1 metre long ash stick (hurley) to strike a hard leather ball (sliotar). It is one of the fastest field sports and due to the nature and rules of the game such as swinging of the hurley and the weight of the sliotar, as one can imagine the likelihood of injury is very high. In previous years helmets were not regularly worn or mandatory. More recently, this changed and helmets have greatly reduced common head injuries. The proportion of hurling-related head injuries among A&E treated players are reduced 10-fold when full head protection is available by wearing both a helmet and faceguard. Evidence was discovered of iatrogenic-like consequences in terms of hand injuries when full head protective equipment was used. American Football is arguably one of the most dangerous sports where players of different weights, sizes, speeds and strengths, depending on their position, face off to tackle the player on the opposition. Because of this, protection is vital especially for smaller players or ones who are playing in positions such as quarter back where more skill and precision is needed over size. In 12-18 year olds there can be huge discrepancies in builds, weights and sizes when playing against their counterparts and this therefore means a vast array of protection must be worn to prevent serious harm. Chin straps: This allows the helmet to be secured correctly allowing a snug fit. Air-filled interior pockets: This design of air-filled pockets works as a preventative measure against serious concussions which are of regular occurrence in the game. Face masks: Face masks can also comprise of a bar which comes down past the nose area and joins 2 or 3 bars from both sides which as its name ‘cage’ suggests it precludes an opponent reaching into the facial area with their hand. 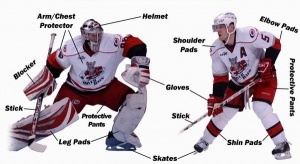 There are many different pads which can be used to absorb blows from another player due to contact such as shoulder pads, thigh pads, elbow pads, hip pads, tail pads and knee pads. Shoulder pads as the name suggests protect the individual’s shoulder but also give protection to the sternum region where some may also provide shield to the rotator cuff and top of the arm. Football boots/cleats can come with studs of varying sizes from ½ inch to 1 inch. The reason behind this is the traction to the ground where the field may differ in its surface from hard to soft ground and with proper selectivity of cleats it therefore prevents injury from falls to the ground. Changes in the design of different sports equipment with particular focus on the helmet has helped to further the protective aspect of players in American Football. Over the years the helmet has changed extensively to provide greater support with added protection with facemasks, etc. The size and weight has also been modified with a heavier helmet and air-filled pockets for a preventative capacity especially for preventing concussions from contact. Ice hockey is a game played in many parts of the world and is a high-contact team sport where two teams use their individual stick to hit a puck into the other’s net. As well as it being a contact sport it is a high-speed game (~20-30mph) where injuries are quite common so protective equipment is of high importance to prevent serious injury. A lot of the game focuses on physicality among players and other influences such as hockey pucks, skate blades and hockey sticks all have an impact in causing serious harm to an individual. Injuries that occur usually include: concussions, muscle strains, broken bones, contusions, hyperextensions and ligament tears. According to Rule 1026 regarding mandatory equipment of the Hockey IIHF Rule Book 2015-2018: For players 18 years of age and younger, mandatory equipment includes helmet, full facemask, elbow pads, gloves, internal mouth guard, and knee and shin protection. You can read this and other mandatory and suggested equipment information in the IIHF Rule Book 2015-2018 by clicking this link here. Below are two videos illustrating how to put on protective hockey gear and how ice hockey equipment protects you. Protective equipment in general is on the rise as it is of vital importance for individuals involved in sport and physical activity. It is even more crucially important for younger adults who are still developing as an injury such as a fall where you hit your head may cause even more damage to a 12 year old than a 20 year old. The reason younger individuals are required to wear more equipment than their adult counterparts is the fact that will be mentioned below such that they are still growing and their bones are still developing which also means they are more susceptible to injuries as a result. To manage injury and educate to prevent overtraining and exposure to excessive levels of physical activity. Rest, ice, hamstring stretching, quadriceps strengthening, patellar tendon taping. Achilles and plantar fascia stretching, or cast immobilisation in extreme cases. To try and educate teams and individuals about the importance of warm-up and stretch before sporting activities. Early initial immobilization of muscle under considerable stretch to reduce oedema and accumulation of scar tissue and earlier recovery of strength. Preventative/protective equipment such as helmets, pads, etc. Overuse injuries: From repetitive application of submaximal stresses to otherwise normal tissue. This is common among organised sports such as American Football, compared with recreational/backyard games. Overtraining and exposure to excessive levels of physical activity can present an increased risk of injury. If not managed properly and efficiently, overuse injuries can affect normal physical growth and maturation. Prevention is key, gradual rather than sudden increases in intensity can usually avoid physical breakdown. Strains: Occur to the muscle due to forceful contraction of the specific area. Strains are commonly arranged among severity making up of 3 degrees of strains with the third being a complete tear of the musculotendinous junction. Contusions: Most commonly occur from contact sports such as previously mentioned ice hockey or hurling. Dislocations: Are not very common among younger athletes; however, when shoulder dislocations occur they can be some of the most incapacitating injuries. Approximately 90% of shoulder dislocation patients can experience Bankart lesions later on, resulting in long-term disability and instability in the labrum-ligament complex. Physeal plate injuries: The most vulnerable part of a younger, immature athlete is that of the physis where physeal plate injuries can have devastating effects on growth. Physeal plate injuries/fractures are often caused by acute mechanical overload often associated with collision/contact sports such as American Football or rugby. There are some criticisms of using certain protective equipment in sports. Why would people be against wearing protection to prevent injury? Below are some arguments against the use of protective equipment in sport. Players: Not used to it, may slow them down or affect vision/performance. Regulatory bodies possibly lenient and not wanting change in the sport which may have been played somewhat successfully for a number of years. In skiing it has been demonstrated that although helmets provide protection, by wearing them they may also increase the risk of concussion from impact. It is only in recent years that the physiotherapist is seen as more of an asset, where their guidance and opinion is taken into great consideration and it is becoming more of the case that they have the final say whether a player is fit to play or is able to continue due to injury or accident. It is becoming quite common to have players wearing more equipment no matter what sport they are playing due to the growth in technology and greater knowledge now learned from extensive research. Most chartered physiotherapists/physical therapists would take a preventative approach in terms of sport and will think of the worst case scenario as they realise from certain sports/physical activities that particular injuries are quite common and any type of protection is greatly welcome. “Wear the right gear. Players should wear appropriate and properly fitting footwear and clothing. Protective equipment such as protective pads, helmets, mouthpieces, face guards, protective cups, and/or eyewear should be worn for particular sports”. Physiotherapists are often involved with the aftermath of injury or accident. Patients are then usually started on a rehabilitation programme which can vary significantly depending on the circumstances. Alternatively, “prehabilitation” (or prehab) is a current and emerging strategy that is used both in sporting and clinical settings to help reduce injury, help maintain physical status or to improve recovery time after surgery. While there have been many studies discussing the effects of prehab in post-operative patients regarding total knee replacements, spinal surgery, cardiac procedures, and colectomies, this part of the Wiki will primarily focus on the effects of prehabilitation to reduce injury occurrence in a sport and physical activity context, particularly in adolescents (aged 12-18). This Wiki will also discuss the physiotherapist’s role for implementing prehabilitation programmes and the scope for more collaboration with coaches, clubs and schools to help prevent injury in adolescents when taking part in sport and physical activity. While there is no actual definition of “prehabilitation”, it is generally recognised as an injury prevention programme that is specific to the individual and chosen sport or activity. Essentially, it is specific training to prevent an injury from occurring. Meir et al. suggest that “prehabilitation describes a systematic approach to identifying common injuries within a specific sport and then designing an appropriate series of exercises that work toward minimizing their incidence.” This is supported by Brukner who explains that the first step of injury prevention is to understand the incidence and severity of injuries, for instance when working with a team the physiotherapist should record all injuries within the squad. This may easily be done when working with a specific sports team or club, however presents barriers for individuals who participate in sport and physical activity with no club affiliation or access to a physiotherapist. Perhaps if physiotherapists have a more collaborative relationship with schools and other organisations it would be possible to reach those adolescents who do not get prehabilitation/injury prevention programmes elsewhere. This could have a promising impact on injury prevention within this population. Indeed, research by Roach et al.suggested that up to half of all injuries that children sustain in sport are preventable, highlighting the potential role a physiotherapist could play. Furthermore, Meir et al. suggested that common injuries sustained in rugby might be preventable or the severity lessened if the affected area of the body goes through a specific preventative conditioning program. Prehabilitation programmes usually consist of strength and conditioning training, proprioception exercises, and sport specific drills. Occasionally psychological skills training may be incorporated. Below explains how these aspects of prehab can help reduce the incidence and severity of injury within adolescents. Strength and conditioning is the most common type of prehabilitation used within young athletes. Studies have found that programmes that include strength, flexibility, balance, and sport‐specific fitness and technique training prevent lower limb injury. It is also thought that the benefit is continued when the prehab is performed throughout the playing season. This provides important information regarding physiotherapy practice, as strength and conditioning should be an ongoing “prehab” strategy for young athletes in which the physio should recommend. This agrees with adult studies which used preventive programmes in volleyball resulting in significant reductions in ankle sprains. Similarly conditioning programmes in football have shown a 50–75% reduction in injuries in general and a significant decrease in ACL injuries. Given the evidence that strength and conditioning training helps prevent injury, it could have important implications for the role of a physiotherapist. A physio that works directly with a club or team has the opportunity to implement a specific strength and conditioning programme and should be incorporated into their role. For adolescents who participate in sport and physical activity however do not have access to a physiotherapist through a club or organisation, physio’s should have a responsibility to work closely with schools to highlight the potential use of strength and conditioning training to prevent injury. 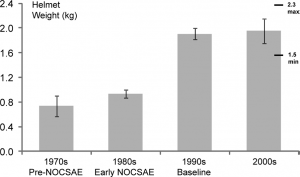 The literature regarding resistance training in adolescents has been conflicted over the last 20 years. Studies have suggested that resistance training in youths can be harmful; however, as well as reducing the incidence of injury, these programs can benefit children and preadolescents by improving their strength, bone density, balance, lipid profiles, fat-free mass, and personal self-esteem. Additionally, strength training can help reduce injury by improving joint integrity, therefore reducing the risk of subluxation, dislocation, and strains. It is within a physiotherapist’s role to ensure that resistance training is kept safe and is in line with the individual's growth. The benefits that can be achieved for adolescents participating in an appropriate resistance training programme are outlined underneath. A properly designed and supervised resistance training program is relatively safe for youths. A properly designed and supervised resistance training program can enhance the muscular strength and power of youths. A properly designed and supervised resistance training program can improve the cardiovascular risk profile of youths. A properly designed and supervised resistance training program can improve motor skill performance and may contribute to enhanced sports performance of youths. A properly designed and supervised resistance training program can increase a young athlete's resistance to sports-related injuries. A properly designed and supervised resistance training program can help improve the psychosocial well-being of youths. A properly designed and supervised resistance training program can help promote and develop exercise habits during childhood and adolescence. It has long been believed that increased flexibility attained through stretching decreases injury incidence. However, recent research by Magnusson et al. has suggested that “pre-exercise stretching in isolation (with or without warm up) does not reduce overall injury rates.” Furthermore, a systematic review by Thacker et al. concluded that, while stretching increased flexibility, increased flexibility did not significantly reduce injury (p=9.3). In animals, immobilization or heating-induced increases in muscle compliance cause tissues to rupture more easily. Stretching before exercise should have no effect for activities in which excessive muscle length is not an issue (e.g., jogging). Stretching won't affect muscle compliance during eccentric activity, when most strains are believed to occur. Stretching can produce damage at the cytoskeleton level. Stretching appears to mask muscle pain in humans. It is important for physiotherapists to be aware of the evidence surrounding stretching including the potential risks it has regarding injury. It should be within their role to know when to recommend the use of stretching and educate young athletes on the matter also. It is thought that proprioceptive training can help information of joint motion and position to be sent quicker to the CNS therefore leading to faster, stabilising and injury-preventing actions of the joints and muscles. A randomised control trial by Sheth et al. examined muscle reaction time of the anterior tibialis, posterior tibialis, peroneus longus, and flexor digitorum longus in response to a sudden, potentially injury-producing change in ankle position (trap-door). Twenty healthy adults were recruited and were divided into a control group (n=10) and an experimental group (n=10). The experimental group were given proprioceptive training using an ankle disc for 8 weeks and were found to have a significant increase of speed at which the muscles responded to the sudden changes in ankle position. Additionally it also altered the rate at which force was produced by the posterior tibialis. If muscles can react more quickly in response to a postural or joint perturbation, there should be better control of movement and a lower risk of uncontrolled motions which might increase injury. If muscles react more quickly, an athlete can function with greater power (more force production per unit time) which could lead to improved performance. Due to the growing evidence within this area, it is becoming more common to incorporate proprioceptive training in prehabilitation programmes to reduce the incidence of injury. Indeed, there is good evidence supporting its use. A systematic review by Aberneth and Bleakley looked at three studies that examined the effectiveness of various proprioceptive training. A study that investigated a home‐based proprioceptive training programme using a wobble board showed improved static and dynamic balance in healthy adolescents and reduced the incidence of injury over a 6‐month period. Similarly, a study by Wedderkopp et al. found that female handball players who implemented the use of an ankle disc to their training programme were less likely to be injured than a control group. It is important for physiotherapists to understand the mechanisms of proprioception and how this aspect of prehab can be beneficial to reduce injury in adolescents. Physiotherapists should recommend the use of proprioceptive training as it has been shown to help muscle reaction time and injury occurrence. Examples of proprioceptive exercises are shown underneath. Helps prepare the body for the specific skills performed in the sport. Helps psychologically prepare the athlete which can help reduce injuries. Should prehabilitation be incorporated into a physiotherapists role? Should physiotherapists collaborate more with other organisations/coaches/individuals about prehabilitation? Develops credibility: By educating patients it will demonstrate your knowledge and reveal you as the best resource for information and treatments. Develops trust: By providing information to the patient that is specific to their problem will aid in developing trust and making them feel better. Increases understanding: If education is provided patients will have a better understanding of their problem and how your treatment is going to help them. Improve compliance: When a patient is discharged it is normal practice to provide educational materials that are informative and specific. This will leave the patient with a positive reaction to the treatment as a whole making them more likely to follow through. That being said not all physiotherapists provide education to the best of their ability. This can be for a number of reasons such as physiotherapists are busy, lack of affordable education materials or the verbal education provided is not enough. Therefore, this section will provide ideas that can be used in practice to educate your patients. The areas covered are only some of the ways that physiotherapists can educate patients in the prevention of injuries. Do you think of education as a main priority when treating patients, more specifically adolescents? Brainstorm some ways to enhance communication with this patient population. Staying hydrated is essential as your body is composed of 60% water on average. 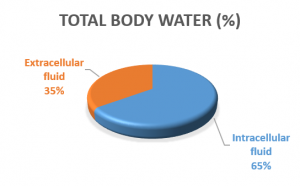 The water is distributed between extracellular (water in between cells and in the blood) and intercellular (inside cells) and is a main component of body fluids such as blood and synovial fluid. A breakdown of fluid is represented in the figure below. The concentration of body fluids is controlled by stimulating thirst or by adapting urinary output; however, if the water loss is not replaced, dehydration can set in. Dehydration can occur if you lose as little as 2% body mass. The individual can develop impaired cognitive function, headaches, decreases in physical performance and develop symptoms of fatigue. If an individual was to become fatigued or not able to perform at their best they increase their chance of injury whether the individual is an adult or child. As well as becoming dehydrated it is also possible to over drink where in rare cases can result in hyponatraemia, low levels of sodium. It is recommended that male adolescents get at least 1.9 litres per day and females need at least 1.6 litres per day; however, this recommendation can change if the individual is taking part in physical activity. During physical activity you need to consume fluids to replace the fluids lost through sweat. Water is a good source of fluid for moderate physical activity although for high intensity activities lasting over 40 minutes it is suggested that drinks with a little sugar and salt would be advised. Some of the benefits of staying hydrated are illustrated in the image below. Therefore, the need for physiotherapists to educate their patients to stay hydrated is a must. It can help to prevent dehydration which could reduce injury occurrences. Think about yourself and whether you drink enough fluids based on the recommendations. Can you think of ways that you could use to encourage adolescents to drink more water and how to measure it? Base meals on starchy carbohydrates, whole grain preferably. Protein: Aiming for fish two times a week. Unsaturated oils and spreads in small amounts. Foods high in fat, salt and sugar should be kept to a minimum. Drink plenty of water: Six to eight glasses a day. To look at the Eatwell Guide in more detail click the picture below. In order to prevent injuries during physical activity, health professionals should be providing adolescents with information about diet. In adolescents, healthy diets and physical activity have been proven to provide many short and long term health benefits. Despite the known benefits of eating regular well balanced meals adolescents are more likely to skip breakfast than any other meal. According to data from the Health Behaviour in school-aged children nearly three fifths of young people don’t meet the required fruit intake and only ⅓ will eat vegetables. This is less than the recommended intake and if these adolescents were to take part in physical activity they could be increasing their chance of injury due to the body not being prepared with the adequate requirements. Eat enough: If you are taking part in regular physical activity it is important to make sure that calorie intake is sufficient. If not, then the body’s ability to repair tissue damage and muscle recovery will decrease. Keep fat in the diet: Although fat has a bad name it is actually required to keep cells healthy and some fats are essential for the inflammation process. Calcium intake: Calcium is needed to keep bones healthy and strong. Especially in adolescents that are still growing the need for calcium is important to reduce risk of bone strains or stress fractures. It is important for a physiotherapist to have an input in nutrition as it will coincide with the treatment process that you have come up with. Although you may feel like the easier job would be to pass this type of work over to a dietician or nutritionist this may not be the case. It may take a short conversation during treatment to change the individual's views which would be more time effective. That being said if it was a more complex case then working alongside other health professionals may be the better option. Can you come up with some meal ideas that would interest adolescents that meet the criteria of the Eatwell Guide? How would you incorporate nutrition into your practice and would you feel confident enough to seek help from experts if needed? Skill acquisition can aid in the prevention of injuries in adolescents. This method of learning involves three stages of learning. Click on the stages of learning to watch a video describing skill acquisition. Studies have found that including skill acquisition in training programs have reduced injury rate in children and adolescents. A study by Scase et al. looked into the effects of teaching landing and falling skills on improving landing skills and preventing injuries in young football players. They used two groups where one was provided the specific landing training and the other group was the control with no additional landing training. Between the groups the intervention group had a lower rate of injuries and onset of injuries was later in the season. Studies by Powers and Fisher and Myer et al. also concluded from research that the involvement of skill acquisition in exercise helps prevent injuries. Powers and Fisher go on to explain that the changes in neuroplasticity in the brain are what underlies the behaviours associated with injury prevention. They say that the decrease in corticomotor excitability may be cause of this change as control is reallocated to the subcortical motor regions after specific skill training. Although these studies focused on specific sports this can be relevant to all physical activities. Therefore, the need for physiotherapists to educate adolescents on basic skills such as landing, balance, running or catching is important. Most of these skills are used within a number of physical activities and if young individuals are not able to master these then they will be increasing their chance of injury occurring. Think of methods and skills that you would use when trying to educate adolescents on skill acquisition. Posture can have a big effect on the prevalence of injuries in physical activity. During adolescent’s teenagers are growing at different rates and these changes can put pressure on the body through changes in posture. Most adolescents are still at school where they are required to sit in a chair for periods of time resulting in slouching in a chair for example. Although this is not directly related to physical activity the same rules apply and what someone does when they are not taking part in physical activity can affect them when they do. 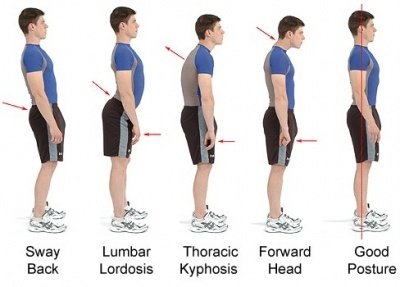 Examples of different postures are illustrated below. The picture includes arrows to show where the change in posture has occurred. Poor posture can lead to changes in muscle balance and length, decrease in sports performance, altered biomechanics, reduced flexibility and an increased risk of developing an injury. Therefore, it would be beneficial if physiotherapists can educate patients on how to maintain a good posture. 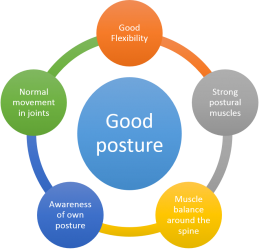 When students are studying to be a physiotherapist they are taught how to identify good posture and key points to look out for and provide advice on thus educating patients about how to maintain posture should be routinely incorporated into treatments when appropriate. Think about your own posture just now as you have been working through this Wiki. Would you say it has been a good example of posture or what would you change? What would you expect an adolescents posture to look like when you first see them? Many children and adolescents take part in games, training and sports on a daily basis because of this the body doesn’t get enough time to fully rest. It is well known that they need to rest between bouts of physical activity as lack of rest and muscle fatigue will increase an individual’s risk of obtaining an injury. The NHS advise that adolescents need between 8 to 9 hours of good sleep to be well rested. In order to this they need to reduce caffeine intake, not eating late at night, limit time spent on electronics and get into a routine. If a teen is not meeting the required amount of rest they are not preparing themselves well for any physical activity that they plan to take part in. A study by Brenner describes that lack of rest can lead to overtraining, overuse injuries and burnout (overtraining syndrome). It is suggested that although physical activity is important too much can cause harm especially as adolescents are growing at different rates meaning the risk of injury increases. A training program that includes a variety rather than constant repetition can help with reducing the stress on the body. If the body is not given this time to recover adolescents may be at risk of developing overtraining syndrome. Watch the video below to gain a better understanding of overtraining syndrome. As a healthcare practitioner providing education on taking rest is important. 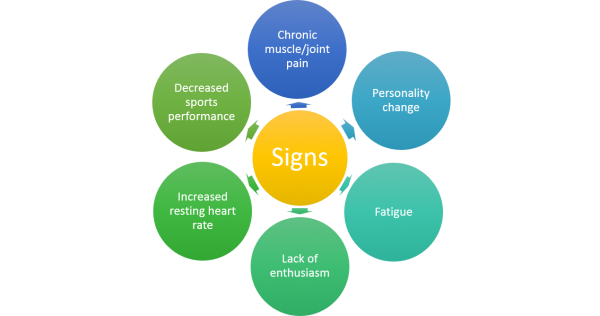 During education individuals should be made aware of the risks of overtraining and advising them on the common signs to look for as this can give them the responsibility of their own wellbeing. During sessions it would be a good idea to ask adolescents how their training is going and whether they have increased their workload recently as this can give you an indication of how they are doing and feeling. Therefore, as a physiotherapist it is important to provide education about the importance of rest as it can help to prevent injuries from occurring. Do you think it would be easy to ask adolescents to reduce time spent on electronics to help increase rest time and why? How would you encourage adolescents to reduce their time spent on physical activity to decrease the risk of overtraining? Encouraging and enforcing current legislation. Educating patients on the importance of protective equipment and prehabilitation in the prevention of injury and accident. Having an input into the law system due to the workload physiotherapists have due to injuries and accidents. Looking into the future, as physiotherapists are at an advantage to other AHPs due to the time spent with patients during assessments and treatment sessions they can utilise this time to educate patients and use research, some of which has been provided in this resource, to highlight the importance of protective equipment in preventing injuries and accidents. This opportunity to educate the general public would hopefully bring about a reduction in the number of injuries. ↑ 1.0 1.1 1.2 1.3 1.4 1.5 1.6 1.7 Collard D, Paw C, Van Mechelen W, Verhagen R. Design of iplay study: systematic development of a physical activity injury prevention program for primary school children. Sports Medicine 2009;39(11):889-901. https://www.ncbi.nlm.nih.gov/pubmed/19827858 (accessed 3 Nov 2016). ↑ National Institute for Health and Care Excellence (NICE). Obesity Clinical Knowledge Summary. http://cks.nice.org.uk/obesity#!topicsummary (accessed 25 Oct 2016). ↑ McCormick B, Stone I. Economic costs of obesity and the case for government intervention. Obesity reviews. 2007 Mar 1;8(s1):161-4. http://onlinelibrary.wiley.com/doi/10.1111/j.1467-789X.2007.00337.x/full (accessed 27 Oct 2016). ↑ Centres for Disease Control and Prevention (CDC). Childhood obesity facts. http://www.cdc.gov/obesity/data/childhood.html (accessed 26 Oct 2016). ↑ Habelt S, Hasler CC, Steinbrück K, Majewski M. Sport injuries in adolescents. Orthopedic reviews. 2011 Nov 7;3(2):18. ↑ Brussoni M, Brunelle S, Pike I, Sandseter EB, Herrington S, Turner H, Belair S, Logan L, Fuselli P, Ball DJ. Can child injury prevention include healthy risk promotion?. Injury prevention. 2014 Dec 22:injuryprev-2014. http://injuryprevention.bmj.com/content/21/5/344.full.pdf+html (accessed 26 Oct 2016). ↑ Emery CA. Injury prevention and future research. InEpidemiology of Pediatric Sports Injuries 2005 Mar 1 (Vol. 48, pp. 179-200). Karger Publishers. ↑ Centers for Disease Control and Prevention (CDC). The Power of Prevention: Chronic disease... the public health challenge of the 21st century. http://www.cdc.gov/chronicdisease/pdf/2009-power-of-prevention.pdf (accessed 21 Nov 2016). ↑ Srivastava D, The London School of Economics and Political Science. Policy Brief: Is prevention better than cure? A review of the evidence. file:///C:/Users/Charmene/Downloads/Research%20Note%202008_prevention%2014_07_2008_FINAL%20(1).pdf (accessed 21 Nov 2016). ↑ CSP. CSP head urges neuro physios to ‘make prevention a priority’. http://www.csp.org.uk/news/2016/03/24/csp-head-urges-neuro-physios-make-prevention-priority (accessed 21 Nov 2016). ↑ CSP. Encouraging healthy spine habits to prevent low back pain in children: an observational study of adherence to exercise. http://www.csp.org.uk/physio-journal/102/3/encouraging-healthy-spine-habits-prevent-low-back-pain-children-observational-s (accessed 21 Nov 2016). ↑ Nielsen PR, Jørgensen LD, Dahl B, Pedersen T, Tønnesen H. Prehabilitation and early rehabilitation after spinal surgery: randomized clinical trial. Clinical Rehabilitation. 2010 Feb 1;24(2):137-48. ↑ CSP. Physios could play greater role in falls prevention. http://www.csp.org.uk/news/2013/06/17/physios-could-play-greater-role-falls-prevention (accessed 21 Nov 2016). ↑ CSP. CSP Scotland response to the The Prevention and Management of Falls in the Community. http://www.csp.org.uk/documents/csp-scotland-response-prevention-management-falls-community (accessed 21 Nov 2016). ↑ NHS Choices. Physical activity guidelines for children and young people. http://www.nhs.uk/Livewell/fitness/Pages/physical-activity-guidelines-for-young-people.aspx (accessed 21 Nov 2016). ↑ 17.0 17.1 17.2 World Health Organisation (WHO). Physical activity. http://www.who.int/topics/physical_activity/en/ (accessed 6 Nov 2016). ↑ CSP. Physiotherapy Framework: putting physiotherapy behaviours, values, knowledge & skills into practice. file:///C:/Users/Charmene/Downloads/physiotherapy_framework_condensed_updated_sept_2013.pdf (accessed 15 Nov 2016). ↑ NHS. The NHS Knowledge and Skills Framework - a short guide to KSF dimensions. http://www.ksf.scot.nhs.uk/uploads/documents/A_Short_Guide_to_KSF_Dimensions.pdf (accessed 11 Nov 2016). ↑ CSP. Professional Frameworks. http://www.csp.org.uk/professional-union/careers-development/career-development/professional-frameworks (accessed 17 Nov 2016). ↑ Spinks AB, Macpherson AK, Bain C, McClure RJ. Injury risk from popular childhood physical activities: results from an Australian primary school cohort. Injury Prevention. 2006 Dec 1;12(6):390-4. https://www.ncbi.nlm.nih.gov/pmc/articles/PMC2704354/ (accessed 8 Nov 2016). ↑ 22.0 22.1 22.2 22.3 Macpherson A, Spinks A. Bicycle helmet legislation for the uptake of helmet use and prevention of head injuries (Review). Cochrane Database of Systematic Reviews. 2007 Feb;2. ↑ 23.0 23.1 Gleave J, Bedford: Transport Planning Society. Cycle helmets: the impacts of cycle helmet legislation on cyclist fatalities and premature deaths in the UK. http://www.cycle-helmets.com/helmets-uk-dec-2012.pdf (accessed 15 Nov 2016). ↑ Cycling UK. Campaign with us. http://www.cyclinguk.org/campaigning/views-and-briefings/cycle-helmets (accessed 15 Nov 2016). ↑ Macpherson A, Spinks A. Bicycle helmet legislation for the uptake of helmet use and prevention of head injuries (Review). Cochrane Database of Systematic Reviews. 2007 Feb;2. ↑ Macpherson AK, To TM, Macarthur C, Chipman ML, Wright JG, Parkin PC. Impact of mandatory helmet legislation on bicycle-related head injuries in children: a population-based study. Pediatrics. 2002 Nov 1;110(5):e60-. ↑ Walter SR, Olivier J, Churches T, Grzebieta R. The impact of compulsory cycle helmet legislation on cyclist head injuries in New South Wales, Australia. Accident Analysis & Prevention. 2011 Nov 30;43(6):2064-71. ↑ Olivier J, Creighton P. Bicycle injuries and helmet use: a systematic review and meta-analysis. International journal of epidemiology. 2016 Jul 22:dyw153. ↑ 30.0 30.1 Macpherson AK, Parkin PC, To TM. Mandatory helmet legislation and children's exposure to cycling. Injury Prevention. 2001 Sep 1;7(3):228-30. ↑ AIBA. AIBA Open Boxing (AOB): Competition Rules. http://aiba.s3.amazonaws.com/2015/02/AOB-Competition-Rules-2015-09-11.pdf (accessed 15 Nov 2016). ↑ 32.0 32.1 32.2 32.3 Merkel DL, Molony Jr JT. Recognition and management of traumatic sports injuries in the skeletally immature athlete. International journal of sports physical therapy. 2012 Dec 1;7(6). ↑ Thompson DC, Rivara FP, Thompson R. Helmets for preventing head and facial injuries in bicyclists. Cochrane database of systematic reviews. 2000;4. ↑ Thompson DC, Rivara FP, Thompson R. Helmets for preventing head and facial injuries in bicyclists. Ann Emerg Med. 2003 May;41(5):738-40. ↑ Thacker SB, Stroup DF, Branche CM, Gilchrist J. Prevention of knee injuries in sports: A systemic review of the literature. Journal of Sports Medicine and Physical Fitness. 2003 Jun 1;43(2):165. ↑ Handoll HH, Rowe BH, Quinn KM, de Bie R. Interventions for preventing ankle ligament injuries. The Cochrane Database of Systematic Reviews. 2001;3(3):CD000018. ↑ Handoll HH, Rowe BH, Quinn KM, de Bie R. Interventions for preventing ankle ligament injuries. The Cochrane Library. 2011. ↑ Knapik JJ, Marshall SW, Lee RB, Darakjy SS, Jones SB, Mitchener TA, dela Cruz GG, Jones BH. Mouthguards in sport activities history, physical properties and injury prevention effectiveness. Sports Medicine. 2007 Feb 1;37(2):117-44. ↑ Sreekaarini I, Eapen C, Zulfeequer CP. 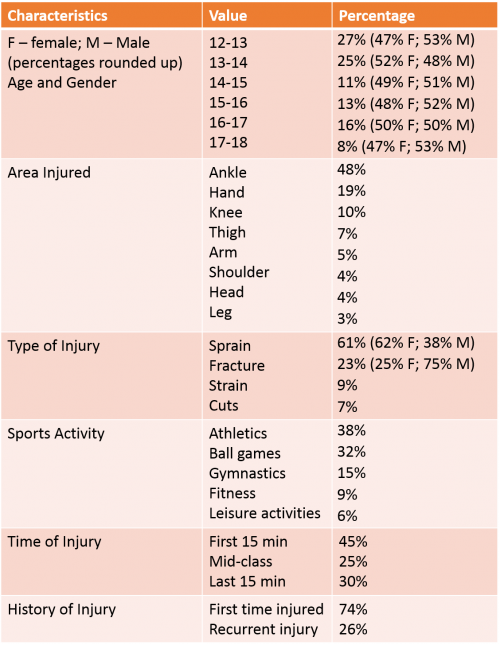 Prevalence of Sports Injuries in Adolescent Athletes. J Athl Enhancement 3. 2014;5:2. ↑ Carmeli E, Azencot S, Wertheim M, Coleman R. Sports injuries in students aged 12-18 during physical education classes in Israel. Biology of Sport. 2003 Jan 1;20(4):271-80. ↑ Crowley PJ, Crowley MJ. Dramatic impact of using protective equipment on the level of hurling-related head injuries: an ultimately successful 27-year programme. British journal of sports medicine. 2014 Jan 1;48(2):147-50. ↑ O'Connor S, McCaffrey N, Whyte EF, Moran KA. Epidemiology of injury in male adolescent Gaelic games. Journal of Science and Medicine in Sport. 2016 May 31;19(5):384-8. ↑ Wiley. 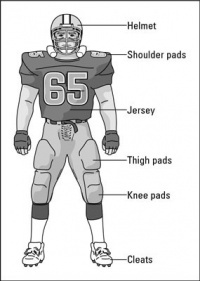 The American Football Player's Uniform. http://www.dummies.com/sports/football/the-american-football-players-uniform/ (accessed 9 Nov 2016). ↑ Lundberg GD, Metzner D. How to Rescue American Football. Cureus. 2016 Apr;8(4). ↑ Council on Sports Medicine and Fitness, Brenner JS, Brooks A, Demorest RA, Halstead ME, Kelly AK, Koutures CG, LaBella CR, LaBotz M, Martin SS, Moffatt K. Reducing Injury Risk From Body Checking in Boys’ Youth Ice Hockey. Pediatrics. 2014 Jun 1;133(6):1151-7. ↑ O’Dowd A. Experts seek ban on tackling in school rugby to prevent child injuries. BMJ. 2016 Mar 3;352:i1289. ↑ Swank AM, Kachelman JB, Bibeau W, Quesada PM, Nyland J, Malkani A, Topp RV. Prehabilitation before total knee arthroplasty increases strength and function in older adults with severe osteoarthritis. The Journal of Strength & Conditioning Research. 2011 Feb 1;25(2):318-25. ↑ Alkarmi A, Thijssen DH, Albouaini K, Cable NT, Wright DJ, Green DJ, Dawson EA. Arterial Prehabilitation. Sports Medicine. 2010 Jun 1;40(6):481-92. ↑ Gillis C, Li C, Lee L, Awasthi R, Augustin B, Gamsa A, Liberman AS, Stein B, Charlebois P, Feldman LS, Carli F. Prehabilitation versus RehabilitationA Randomized Control Trial in Patients Undergoing Colorectal Resection for Cancer. The Journal of the American Society of Anesthesiologists. 2014 Nov 1;121(5):937-47. ↑ Meir R, Diesel W, Archer E. Developing a Prehabilitation Program in a Collision Sport: A Model Developed Within English Premiership Rugby Union Football. Strength & Conditioning Journal. 2007 Jun 1;29(3):50-62. ↑ Brukner P. Brukner & Khan's clinical sports medicine. North Ryde: McGraw-Hill; 2012. ↑ Roach R, Maffulli N. Childhood injuries in sport. Physical Therapy in sport. 2003 May 31;4(2):58-66. ↑ Abernethy L, Bleakley C. Strategies to prevent injury in adolescent sport: a systematic review. British journal of sports medicine. 2007 Oct 1;41(10):627-38. ↑ Bahr R, Lian Ø, Bahr IA. A twofold reduction in the incidence of acute ankle sprains in volleyball after the introduction of an injury prevention program: a prospective cohort study. Scandinavian journal of medicine & science in sports. 1997 Jun 1;7(3):172-7. ↑ Stasinopoulos D. Comparison of three preventive methods in order to reduce the incidence of ankle inversion sprains among female volleyball players. British journal of sports medicine. 2004 Apr 1;38(2):182-5. ↑ Verhagen E, Van der Beek A, Twisk J, Bouter L, Bahr R, Van Mechelen W. The effect of a proprioceptive balance board training program for the prevention of ankle sprains a prospective controlled trial. The American journal of sports medicine. 2004 Sep 1;32(6):1385-93. ↑ Ekstand J, Gillquist J. Prevention of sport injuries in football players. International journal of sports medicine. 1984 Nov;5(S 1):S140-4. ↑ Pearce PZ. Prehabilitation: preparing young athletes for sports. Current sports medicine reports. 2006 Jun 1;5(3):155-60. ↑ Webster DA, Bayliss GV, Spadaro JA. Head and face injuries in scholastic women's lacrosse with and without eyewear. Medicine and science in sports and exercise. 1999 Jul;31(7):938-41. ↑ Olsen OE, Myklebust G, Engebretsen L, Holme I, Bahr R. Exercises to prevent lower limb injuries in youth sports: cluster randomised controlled trial. Bmj. 2005 Feb 24;330(7489):449. ↑ Wedderkopp N, Kaltoft M, Lundgaard B, Rosendahl M, Froberg K. Prevention of injuries in young female players in European team handball. A prospective intervention study. Scandinavian journal of medicine & science in sports. 1999 Feb 1;9(1):41-7. ↑ Kaminski TW, Perrin DH. Effect of prophylactic knee bracing on balance and joint position sense. Journal of athletic training. 1996 Apr;31(2):131. ↑ Caraffa A, Cerulli G, Projetti M, Aisa G, Rizzo A. Prevention of anterior cruciate ligament injuries in soccer. Knee surgery, sports traumatology, arthroscopy. 1996;4(1):19-21. ↑ Faigenbaum AD, Kraemer WJ, Blimkie CJ, Jeffreys I, Micheli LJ, Nitka M, Rowland TW. Youth resistance training: updated position statement paper from the national strength and conditioning association. The Journal of Strength & Conditioning Research. 2009 Aug 1;23:S60-79. ↑ Magnusson SP, Simonsen EB, Aagaard P, Dyhre-Poulsen P, McHugh MP, Kjaer M. Mechanical and physiological responses to stretching with and without preisometric contraction in human skeletal muscle. Archives of physical medicine and rehabilitation. 1996 Apr 30;77(4):373-8. ↑ Brukner P, Khan K, Agosta T. Biomechanics of common sporting injuries. Clinical sports medicine. Sydney (Australia): McGraw-Hill. 2001:56-8. 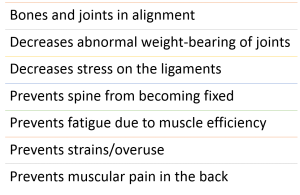 ↑ Thacker SB, Gilchrist J, Stroup DF, Kimsey Jr CD. The impact of stretching on sports injury risk: a systematic review of the literature. Medicine & Science in Sports & Exercise. 2004 Mar 1;36(3):371-8. ↑ Shrier I. Stretching before exercise does not reduce the risk of local muscle injury: a critical review of the clinical and basic science literature. Clinical Journal of Sport Medicine. 1999 Oct 1;9(4):221-7. ↑ Anderson O. Proprioceptive training and injury prevention. http://www.sportsinjurybulletin.com/archive/proprioceptive-exercises.html (accessed 16 Nov 2016). ↑ Sheth P, Yu B, Laskowski ER, An KN. Ankle disk training influences reaction times of selected muscles in a simulated ankle sprain. The american journal of sports medicine. 1997 Jul 1;25(4):538-43. ↑ Emery CA, Cassidy JD, Klassen TP, Rosychuk RJ, Rowe BH. Effectiveness of a home-based balance-training program in reducing sports-related injuries among healthy adolescents: a cluster randomized controlled trial. Canadian Medical Association Journal. 2005 Mar 15;172(6):749-54. ↑ NHS. Physiotherapy. http://www.nhs.uk/conditions/Physiotherapy/pages/introduction.aspx (accessed 16 November 2016). ↑ Chartered Society of Physiotherapy (CSP). What is physiotherapy? http://www.csp.org.uk/your-health/what-physiotherapy (accessed 16 Nov 2016). ↑ Physical Therapy Web. The value of patient education. http://physicaltherapyweb.com/value-patient-education/ (accessed 17 Nov 2016). ↑ 84.0 84.1 84.2 84.3 84.4 Benelam B, Wyness L. Hydration and health: a review. British Nutrition Foundation Nutrition Bulletin. 2010;35:3-25. 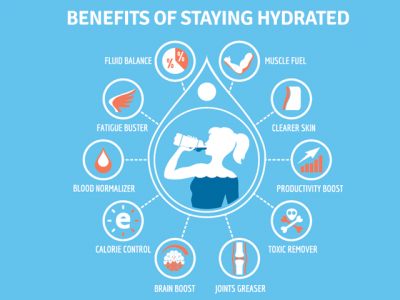 ↑ Ritz P, Berrut G. The importance of good hydration for day-to-day health. Nutrition reviews. 2005 Jun 1;63(suppl 1):S6-13. ↑ Shirreffs SM. The importance of good hydration for work and exercise performance. Nutrition reviews. 2005 Jun 1;63(suppl 1):S14-21. ↑ Healthy Kids. Drinks for hydration. https://www.healthykids.nsw.gov.au/kids-teens/stats-and-facts-teens/teens-nutrition/drinks-for-hydration.aspx (accessed 12 Nov 2016). ↑ Forsythe C. Your biggest hydration questions answered. https://www.girlsgonestrong.com/blog/nutrition/water-hydration/ (accessed 8 Nov 2016). ↑ Gov.uk. The eatwell guide. 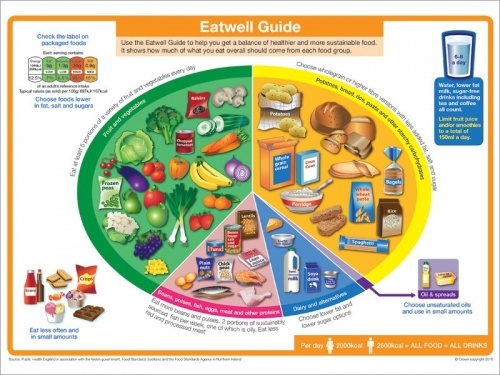 https://www.gov.uk/government/publications/the-eatwell-guide (accessed 9 Nov 2016). ↑ NHS. The eatwell guide. http://www.nhs.uk/Livewell/goodfood/Pages/the-eatwell-guide.aspx (accessed 17 Nov 2016). ↑ Biddle SJ, Gorely T, Stensel DJ. Health-enhancing physical activity and sedentary behaviour in children and adolescents. Journal of sports sciences. 2004 Aug 1;22(8):679-701. ↑ 92.0 92.1 92.2 Pearson N, Atkin AJ, Biddle SJ, Gorely T, Edwardson C. Patterns of adolescent physical activity and dietary behaviours. International Journal of Behavioral Nutrition and Physical Activity. 2009 Jul 22;6(1):1. ↑ Dwyer JT, Evans M, Stone EJ, Feldman HA, Lytle L, Hoelscher D, Johnson C, Zive M, Yang M. Adolescents’ eating patterns influence their nutrient intakes. Journal of the American Dietetic Association. 2001 Jul 31;101(7):798-802. ↑ Triathlete. Eat to prevent injury. http://www.triathlete.com/2011/01/nutrition/eat-to-prevent-injury_18271 (accessed 16 Nov 2016). ↑ Scase E, Cook J, Makdissi M, Gabbe B, Shuck L. Teaching landing skills in elite junior Australian football: evaluation of an injury prevention strategy. British journal of sports medicine. 2006 Oct 1;40(10):834-8. ↑ Powers CM, Fisher B. Mechanisms underlying ACL injury-prevention training: the brain-behavior relationship. Journal of athletic training. 2010 Sep;45(5):513. ↑ Myer GD, Faigenbaum AD, Chu DA, Falkel J, Ford KR, Best TM, Hewett TE. Integrative training for children and adolescents: techniques and practices for reducing sports-related injuries and enhancing athletic performance. The Physician and sportsmedicine. 2011 Feb 1;39(1):74-84. ↑ Cahirphysio. Pilates for teenagers. http://cahirphysiotherapy.com/category/injury-prevention/ (accessed 19 Nov 2016). ↑ Mayfield Clinic. Posture of a healthy back. http://www.mayfieldclinic.com/PE-POSTURE.htm (accessed 28 Oct 2016). ↑ Donaldson-Barron. Strategies to prevent injury in adolescent sport. http://www.kidslink.co.nz/strategies-to-prevent-injury-in-adolescent-sport/ (accessed 18 Nov 2016). ↑ Sippel K. Prevention and Treatment of Pediatric and Adolescent Overuse Injuries. Undergraduate Research Journal for the Human Sciences. 2013 Apr 9;12(1). ↑ Johns Hopkins Medicine. 10 tips for preventing injuries in kids and teens. http://www.hopkinsmedicine.org/health/articles-and-answers/prevention/10-tips-for-preventing-sports-injuries-in-kids-and-teens (accessed 19 Nov 2016). ↑ NHS. Sleep tips for teenagers. http://www.nhs.uk/Livewell/Childrenssleep/Pages/teensleeptips.aspx (accessed 19 Nov 2016). ↑ Brenner JS. Overuse injuries, overtraining, and burnout in child and adolescent athletes. Pediatrics. 2007 Jun 1;119(6):1242-5. ↑ Kreher JB, Schwartz JB. Overtraining syndrome a practical guide. Sports health: a multidisciplinary approach. 2012 Mar 1;4(2):128-38. ↑ Kreher JB. Diagnosis and prevention of overtraining syndrome: an opinion on education strategies. Open Access Journal of Sports Medicine. 2016;7:115.